Wanted to change the color of the Christmas tree so it was different than my daughter's card with the green Christmas tree. 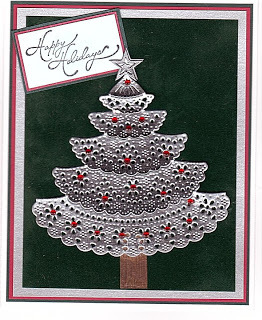 I used heavy silver cardstock for the tree, raised the bottom of each layer with mounting tape and added the red gems. I layered it on dark green velvet first and more layers of silver, red and green.